I've started some new projects and I'm so happy that I can take as much time with them as I want. Strangely, I've been knitting on them a lot more than I thought I would, probably because I don't feel pressured to do it. The first is another lace shawl, the Autumn Arbor Stole by Anne Hanson. 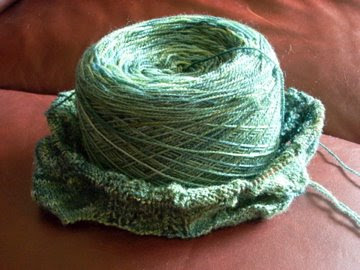 I really love this yarn (in the Mystic Mountain Pine colorway) gifted to me by my sister for my birthday, and I enjoy knitting the pattern as well, which is just plain awesome. As you can see, I haven't done much with it. I got rather sick of using post-its to mark which row I'm on and am now waiting for my Chart Keeper to arrive before I continue with this one. It's just too hard to get in a knitting groove when I have to stop every row and move numerous post-its up half a centimeter each time... 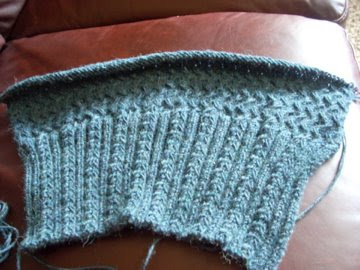 The chart keeper is supposed to arrive tomorrow and then maybe I can start making some progress on the stole. In the meantime, I decided to cast on for a sweater. I'm using Berroco Ultra Alpaca in the "Tanzanite Mix" colorway, also given to me by my sister. (No wonder I haven't bought yarn since Valentine's Day). The pattern is from an old 2005 Bouton d'Or catalogue and you will all just have to wait until I'm done to see what it looks like because as of right now there are no pictures other than the one in the catalog(ue). So far I just have a bit of the back done. I've also joined Team CrankyPants! (I don't know how to get the team picture thing to show up here) for the Tour de Fleece (rav link), so I'll be spinning each day trying to meet my goals (which are relatively sparse and not clearly defined.) Instead of boring you all with pictures of spindles with in-progress singles, what I think I'm going to do is just take a picture a day of whatever I've spun, and then at the end do a sort of summary post with all the pictures so you can see my progress and I'll post what I ended with as well. Email still not working, but hopefully it'll be back up tomorrow. I then just have to figure out how to use the new layout (my University switched to a new email provider or something and is moving us all over there). If I haven't gotten back to your comments yet, I promise I will when my email is working again. That stole looks lovely! I think if I'd seen that first, I might've been more tempted in that direction than the maplewing. And what a great color! "Team Cranky Pants", very funny! Oooh la! It's like sea foam made into yarn. Purty. I wish my sister had such great taste in birthday presents.